This is my second reflective post following my participation and involvement in planning for Edcamp Delta. 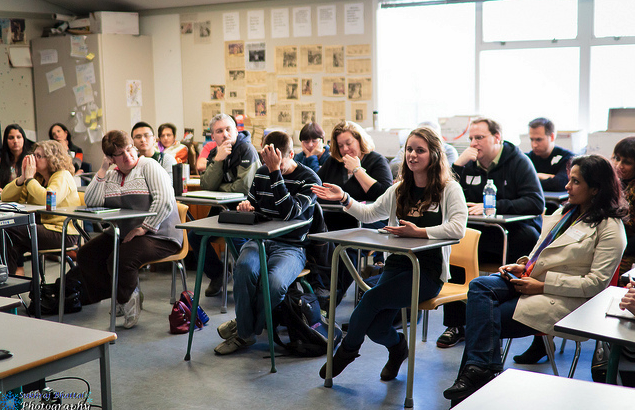 Having now participated at two Edcamps (Edcamp Vancouver was my first), what has struck me is that on both occasions, I have been in 'flow' throughout the events. …a sense that one’s skills are adequate to cope with the challenges at hand, in a goal-directed, rule-bound action system that provides clear clues as to how well one is performing. Concentration is so intense that there is no attention left over to think about anything irrelevant, or to worry about problems. An activity that produces such experiences is so gratifying that people are willing to do it for its own sake, with little concern for what they will get out of it, even when it is difficult, or dangerous. As learners, we are intrinsically motivated to seek conditions of flow. 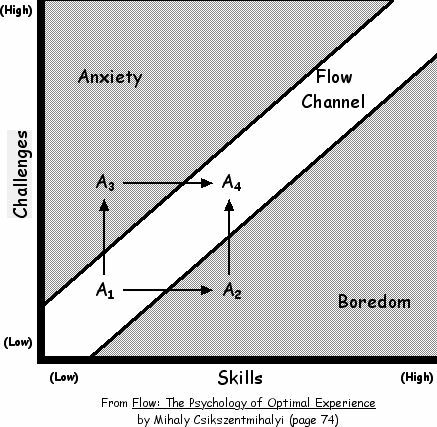 According to Csikszentmihalyi (see graph), “skills” and “challenges” are the two key variables in the flow experience. As a learner's skills (and knowledge) about a particular topic grow, the level of challenge must increase in order for him/her to stay in 'flow'. What attracts me to most education conferences is the specific topic and presenter. I approach these conferences with genuine enthusiasm since it isn't everyday I have the opportunity to listen to an expert in the field of education. Unfortunately, in some cases I have come away disappointed. It's not that I've disagreed with the information or advice but sometimes the presenter has provided information I've already heard, strategies that are already part of my daily practice or some combination of information and strategies which either don't apply to my work or which I lack the requisite knowledge to build on. In other words, I quickly became bored because I wasn't challenged to learn something new or I tuned out because I lacked the prior knowledge to connect the new ideas to. Compounding this is the fact that 'experts' often take a transmissive approach and as a result it has been difficult to interact with the content and personalize the learning to my own context. Edcamps are different! Participants display an energy and enthusiasm that is contagious. Throughout the day participants introduce themselves to one another, reacquaint themselves with old colleagues and engage passionately in conversation. Sessions do not consist of 'experts' telling passive listeners new information. Rather, edcampers ask questions, seek advice and share their successes, failures, challenges and learning. They contribute ideas and are equally as interested in helping build others' knowledge and skills as they are their own. Participants engage in dialogue and respond directly to one another. There is a wealth of expertise in the room but there isn't one expert at the front of the room. Because participants have chosen the discussion topics they are interested in, the sessions are lively, engaging and allow each participant to make meaning and contextualize the conversations they've heard. I have never been bored at an edcamp because the conversations challenge my thinking and force me to reflect on my current practice. If anything, as sessions conclude I find myself with the desire to continue the discussions into breaks and over lunch. 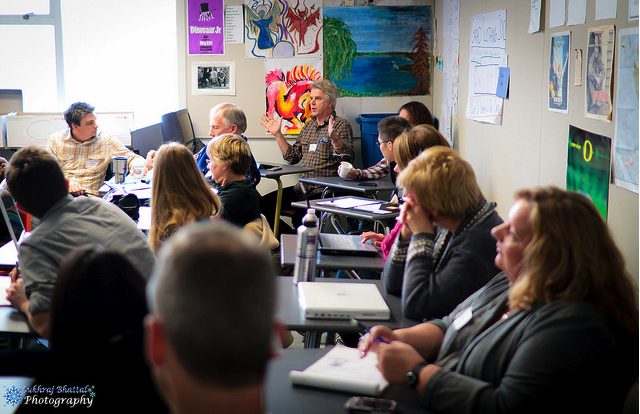 As Brian Kuhn (@bkuhn) recently tweeted, "Edcamp is like a hallway conversation on steroids!" 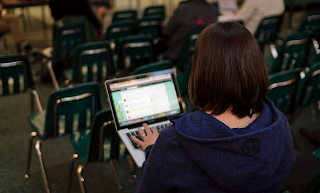 The social nature of an edcamp also occurs through a conference backchannel. 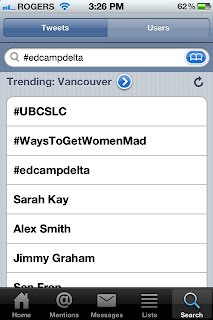 The Twitter backchannel at Edcamp Delta was so popular that at one point in the afternoon the hashtag #edcampdelta was trending. Similar to the face-to-face conversations, participants use the backchannel to tweet comments they've heard, ask questions, reflect on their learning and share resources. The backchannel also allows people who are unable to participate in person to follow the discussion and contribute from a distance. I'm always shocked when each session concludes and when the day draws to a close at an edcamp. Being so intensely focussed, time seems to slip by so quickly. Because I've been concentrating so hard throughout the day, I find myself mentally exhausted as the day wraps up. However, I also find I'm inspired by the ideas and experiences that people have shared with me during my many conversations. I'm thankful to have engaged in so face-to-face and backchannel conversations at Edcamp Delta and Edcamp Vancouver and I know they have allowed me to construct meaning and apply my learning to current situations and challenges I face at school. I'm also grateful to the participants who have peaked my curiosity, led me toward new challenges and kept me in 'flow' at Edcamp! It would be interesting to see schools adopt an edcamp style curriculum. However the first step would be to get more students interested. I attended Edcamp Delta and was disappointed with the lack of students there (everyone I talked to were either teachers or administrators). If we want to improve the system, we need students' feedbacks as well. 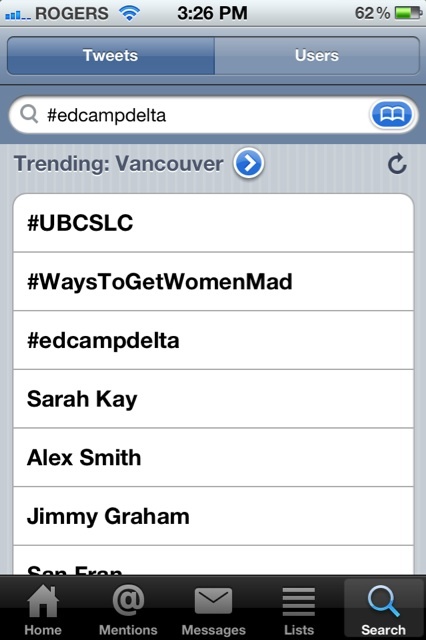 Interesting you say you were disappointed that there weren't many students present at Edcamp Delta. There were 15 students from Delta Secondary who participated. I'm also aware of 2-3 other high school students from other schools who joined us for the day. Add to this a handful of very recent graduates from high school and i'd say there were roughly 20 people who were contributing a vey recent high school perspective. I recognize this means that only about 15% of participants were students but I think it says something powerful when this many students are willing to give up a full Saturday to engage in conversations about education. What impresses me even more about the students from Delta Secondary is that they are continuing to engage in conversations that started at Edcamp. So, yes we should be seeking more and more student input as we look to improve education. I think that through edcamps and other student voice conferences, we are heading in the right direction.